I admire the strength that it took for my family members to share memories at my father’s funeral this weekend. I was unable to hold myself together enough to speak. Had I spoken, I would have talked about ties. I’ve been thinking a lot about ties lately (I do mean neck ties). During my dad’s time as both a pastor and an engineer, he wore a lot of ties. I remember as a little girl I used to love looking through my dad’s ties. For Father’s Day one year, my sister and I took this fabric that was green and white checked with big lady bugs on it and sewed it onto an old tie that my dad had. He wore it to church that Father’s Day Sunday, and almost every Father’s Day after. He even wore it on Father’s Days after we grew up and moved out. I wish that one of those years we had taken a picture of dad in his Father’s Day tie. One Sunday, when I was in middle school, dad was preaching and had gotten extremely animated about one of his main points. His tie had turned backwards so that the tail and tag were facing out. Our family discretely motioned for him to fix his tie. Those motions must not have been clear enough, because he smoothed his tie instead of flipping it back over. By the end of his sermon, his backward-facing tie was laying very nice and straight. While I was growing up, dad had expressed several times how cool he thought it would be to own a real bow tie and tie it himself. For his 50th birthday this year, I wanted to get him something special. So I bought him a very classy black bow tie and looked up the instructions on how to tie one for him on YouTube. A week or so after his birthday, I received an email from my dad with several in-progress photos of him tying the bow tie. One of my cousins shared on Facebook recently that he remembered my dad as a man who when he wanted to do something, he learned how. That was how dad was with the bow tie (and many other things in his life). 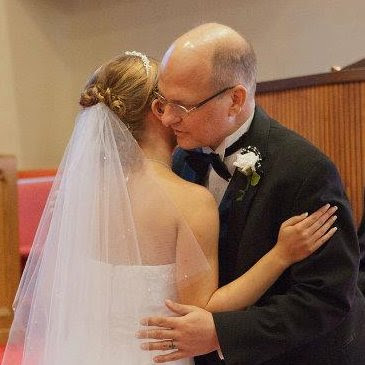 Dad went to a great deal of trouble to tie that bow tie and wear it when he walked me down the aisle and when he danced with me at my wedding. It’s the little stuff that sticks with you, the stuff that can’t be captured in an obituary. This entry was posted in My Life, Stupid Cancer and tagged Dad by Rachel. Bookmark the permalink.